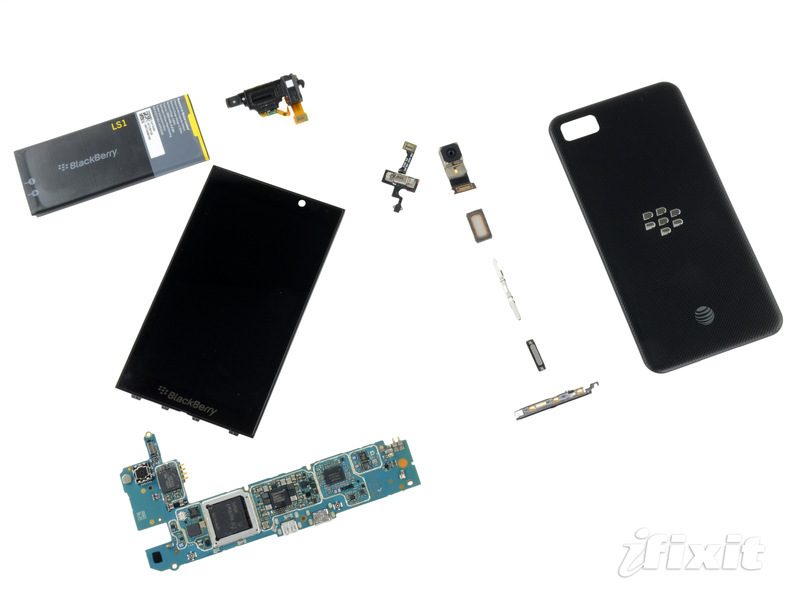 BlackBerry Z10, the latest smartphone from the Canadian mobile phone maker and the first to run under the new BlackBerry 10 operating system, and been torn down by the people over at iFixit, who were interested in learning more on what it packs inside. BlackBerry enthusiasts who already grew fond of the handset’s looks will certainly appreciate a look at its internal circuitry, especially since this is the first BlackBerry to pack a dual-core Snapdragon S4 processor inside. As expected, the teardown exposed the phone’s new motherboard, along with its 3.8 V, 1800 mAh Lithium-ion battery, the 8 megapixel auto-focus camera, 16 GB MLC NAND Flash from Samsung, 3-axis MEMS Accelerometer and 3D Accelerometer & 3D Gyroscope, and the like. All the details on the matter can be found on this page, complemented by photos with all the BlackBerry Z10 internals.